Granada, Spain conjures up visions of the fabled history of Andalusia, the breath-taking magnificence of the Alhambra, the Moorish conquerors turned overlords. But Granada, Nicaragua? 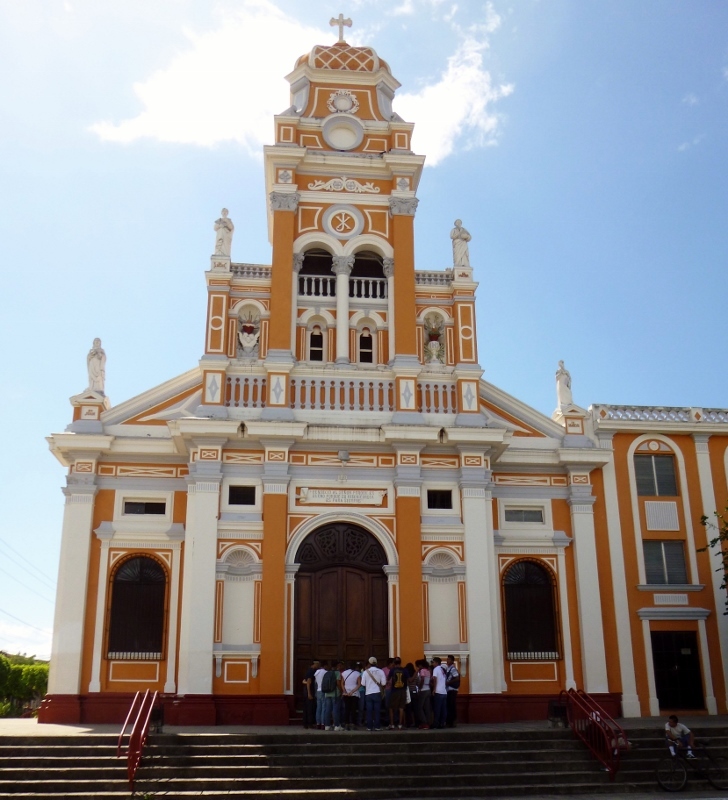 Before our Nicaragua sojourn our conversations with travelers suggested to us that we would prefer Leon, Granada’s sister city on Lake Managua, which is the larger of the two cities, the liberal bastion, the university town. 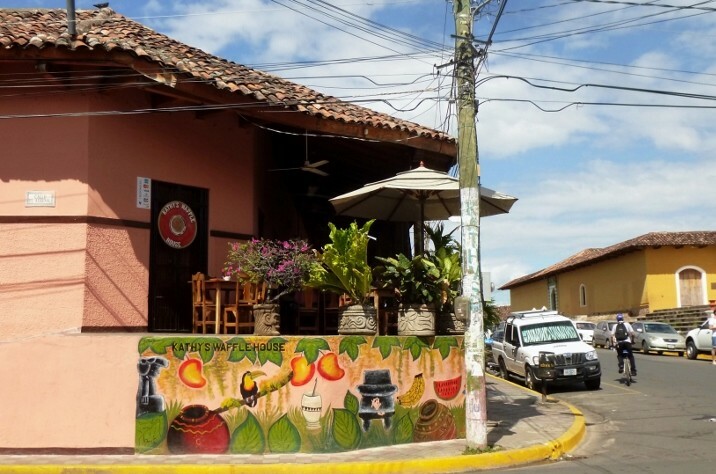 Granada is smaller, more commercial, more conservative, favored by tourists seeking more amenities. 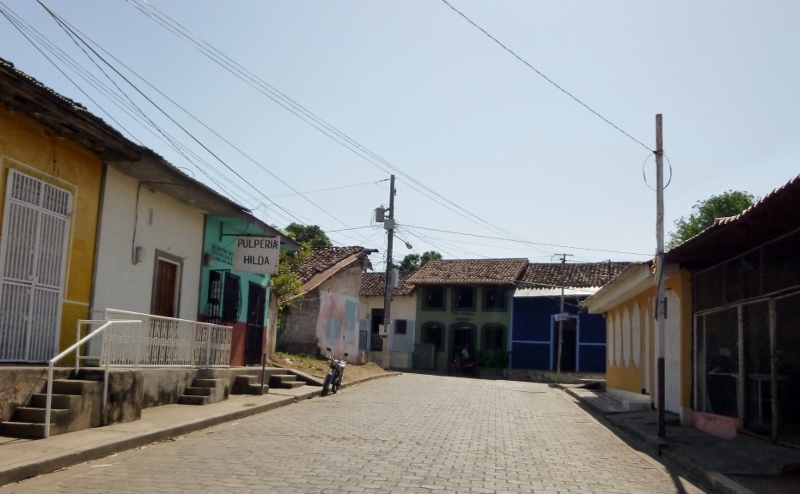 We were fully prepared to be drawn more to Leon; so it came as somewhat of a surprise that we were captivated by Granada, Nicaragua. 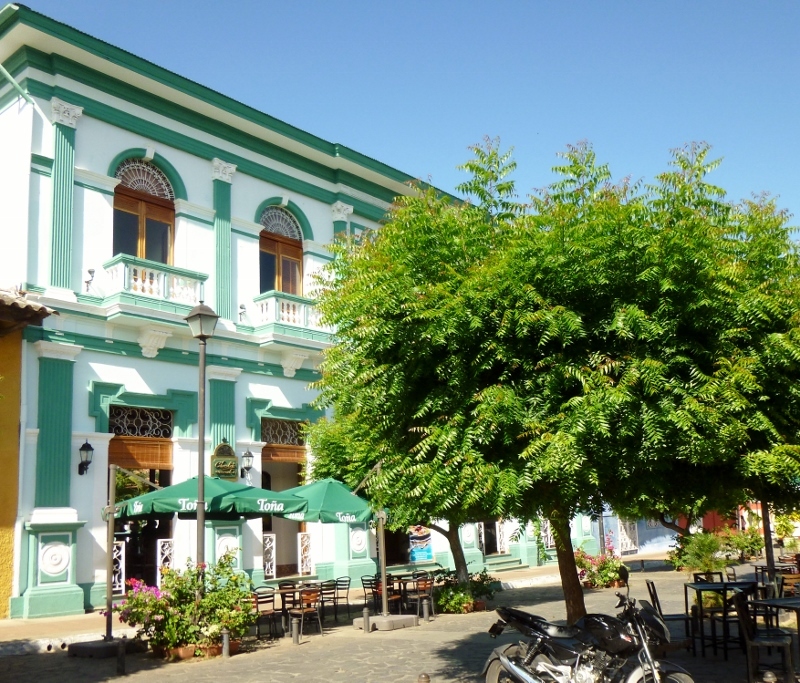 In Granada the colonial architecture around the city is being refurbished and upgraded; its charm enhanced with each renovation. The city has begun to effectively lure the tourist – the more affluent class beyond the transient, back-packer crowd. Avenida Calzada, jutting out of Parque Central, is a vital, bustling, pedestrian thoroughfare crowded with restaurants catering to many tastes. 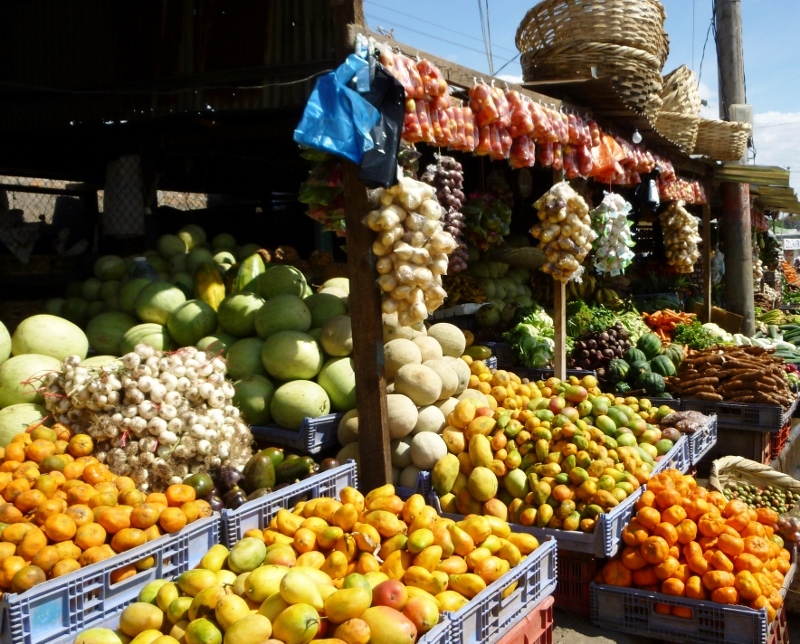 The adjoining streets offer more eateries, watering holes, souvenir shops selling traditional handicrafts and shops seeking to accommodate the needs of a growing city. 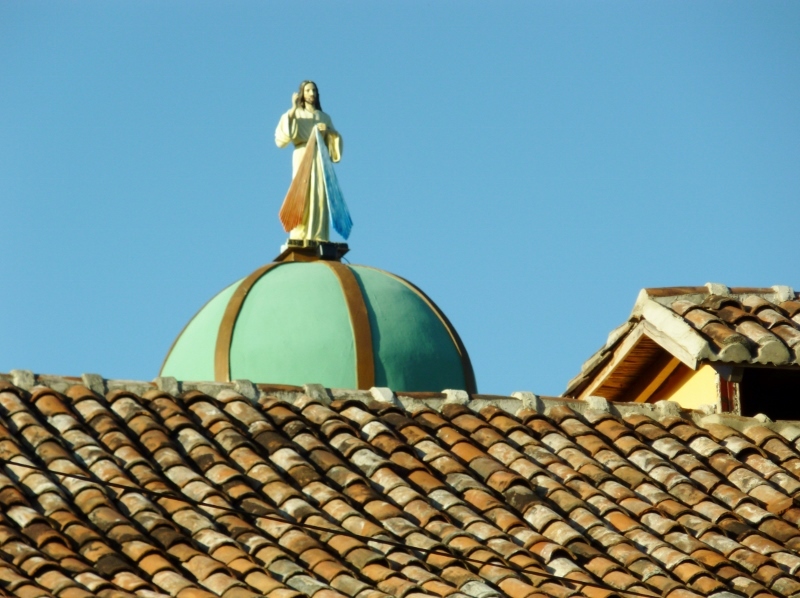 Scattered around the historic city center are the cathedrals and churches which lend an air of dignity and accentuate the beauty of the skyline. 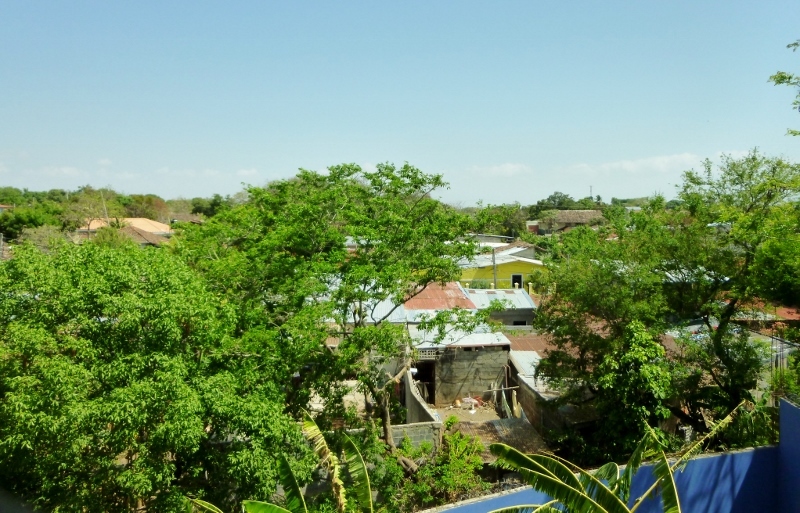 Breezes blowing off Lake Nicaragua help cool the air, in all but the dry season, vitalizing the city. The physical expression of a city is fundamentally important; it’s the first impression, it’s what keeps you wanting to dig deeper, to know more. And what began to emerge, what drew us back for the third and extended stay was the relaxed feel and hospitality exerted by the expat community of varying backgrounds and nationalities. There is an eclectic mix of full-time residents, part-time residents and visitors driven by a multitude of personal motivations. The mix includes retirees, entrepreneurs, gap-year students, NGO professionals, volunteers, vagabonds and thrill-seekers. And most have those ex-pat qualities of gregariousness and affability. It is the norm to run into acquaintances on any short journey as we walk about the city and, since shank’s mare is the preferred mode of travel, social contact is amplified. 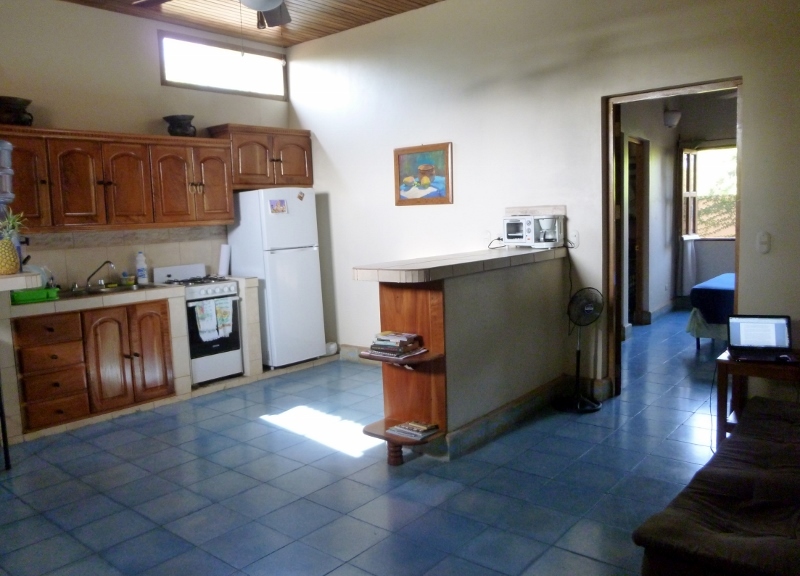 To augment the welcoming ambiance provided by the architecture and the expats, there is also the availability of world-class medical care and international transportation options found in the capital, Managua, just a short drive north of Granada. Vivian Pellas Medical Center, a newly constructed facility and private hospital, offers exceptional health care services at extremely affordable costs; it’s possible to ensure medical coverage through a monthly payment option. 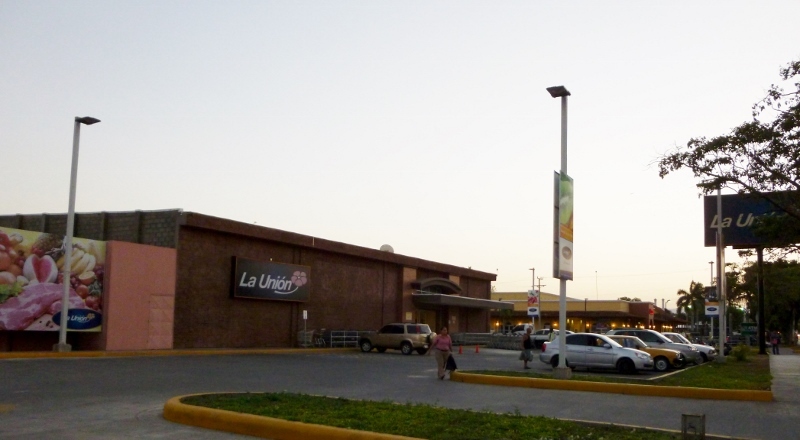 International flights are readily available at the Augusto C. Sandino International Airport to whisk tourists and expats to the States, Canada or any onward destination. Tica Bus Line has daily routes to all the capital cities in Central America and Mexico, so low-cost modes of transport are available for shorter jaunts. So it’s hard to leave a city that we have come to appreciate and friends with whom we’ve had great conversations and with whom we could develop deeper bonds given more time. But we both agree that it’s time for new experiences and locations; time to leave a city and a country that have imprinted themselves upon us and move south, leaving Granada in the rear view. After a short drive from Matagalpa along windy roads and climbing to an elevation above 3,000 feet we arrived at the Selva Negra Mountain Resort in the late afternoon. Almost immediately we felt that we had taken a step back into both another time and another country. 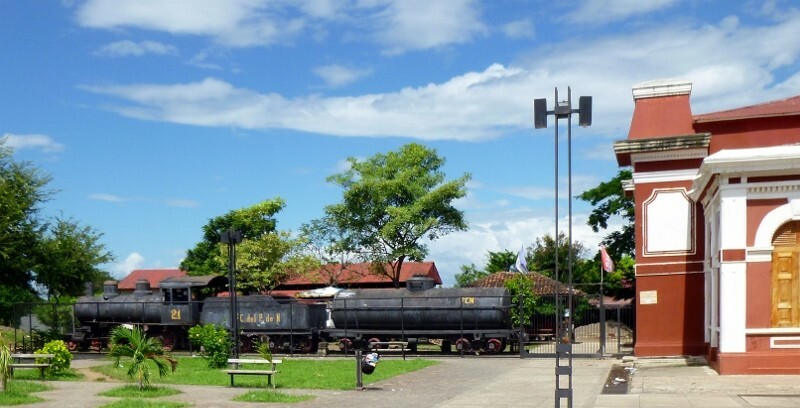 Picture a little bit of Germany set down in the highlands of northern Nicaragua. 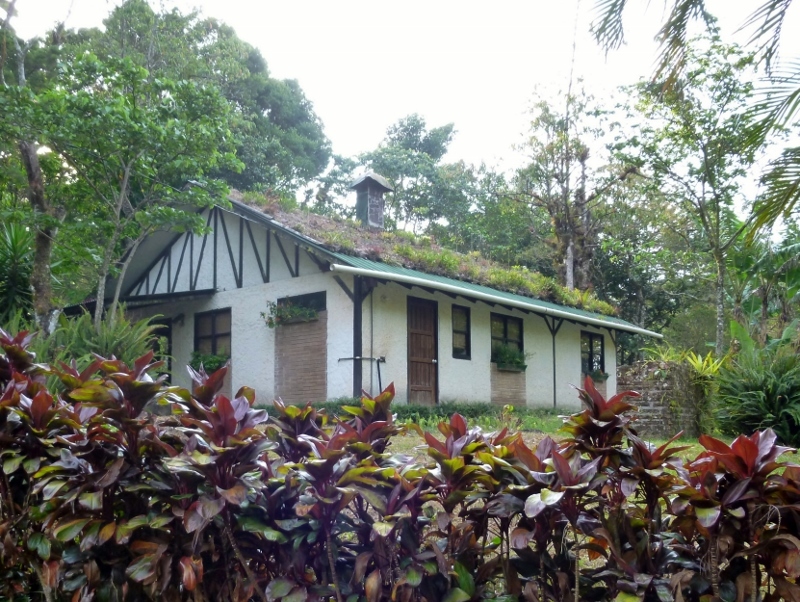 Quaint Bavarian-style bungalows and chalets, each with a few rocking chairs in front, were scattered along the road or set near a pond that reflected the deep greens of the cloud forest that surrounded the little valley. Although the mists had burned away earlier in the day the weather was noticeably cooler and damper and fresher when compared to the lower elevations of the country. 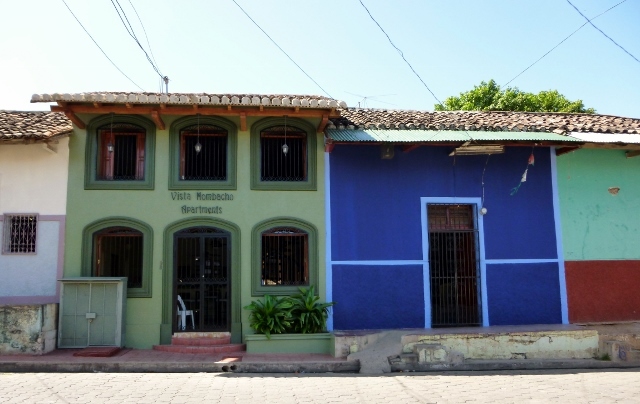 The European style architecture and geese wandering around did little to ground us in Nicaragua; if a German milkmaid had come around the corner with a pail of sloshing milk we wouldn’t have been too surprised. 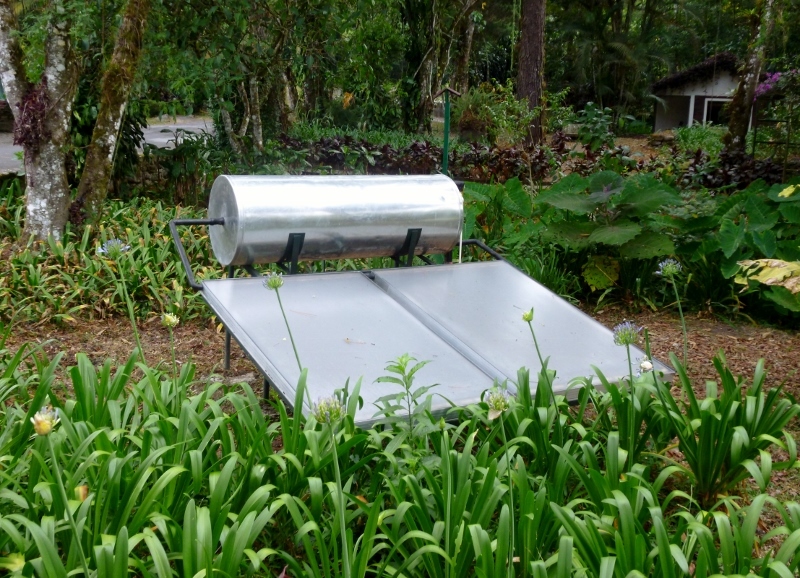 So, how did this bit of transplanted Germany wind up here in Nicaragua? 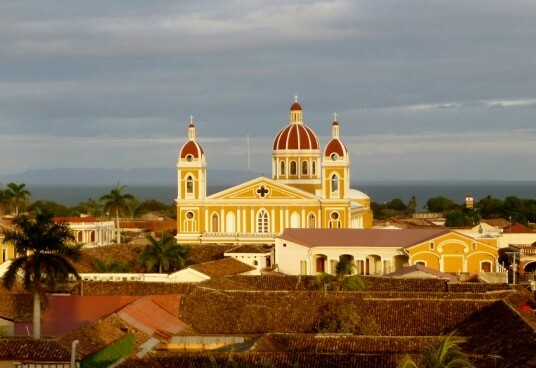 Wikipedia says that, “In the 1850s, when gold was discovered in California, many American and European passengers made their way to California crossing the Isthmus of Central America through Nicaragua”. Among those seeking their fortunes was a German couple, Ludwig Elster and Katharina Braun. 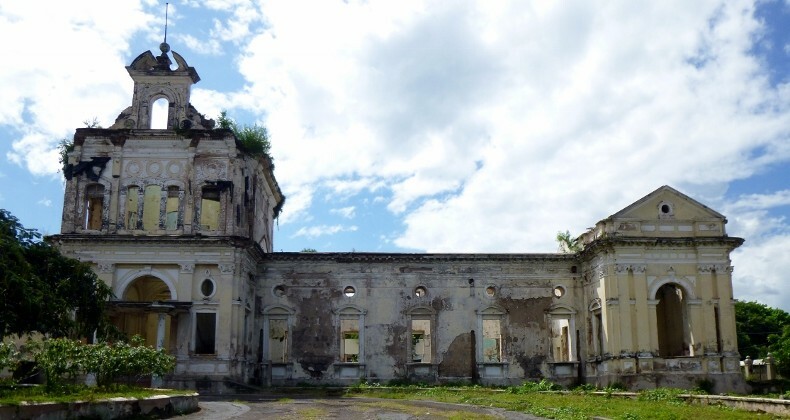 Evidently the northern highlands of Nicaragua reminded them of the region they were from and, travel-weary, they chose to remain in the area they later called Selva Negra, the Black Forest, rather than continue to San Francisco. They planted the first coffee beans in the area and were joined later in their farming community by other Europeans and Americans. 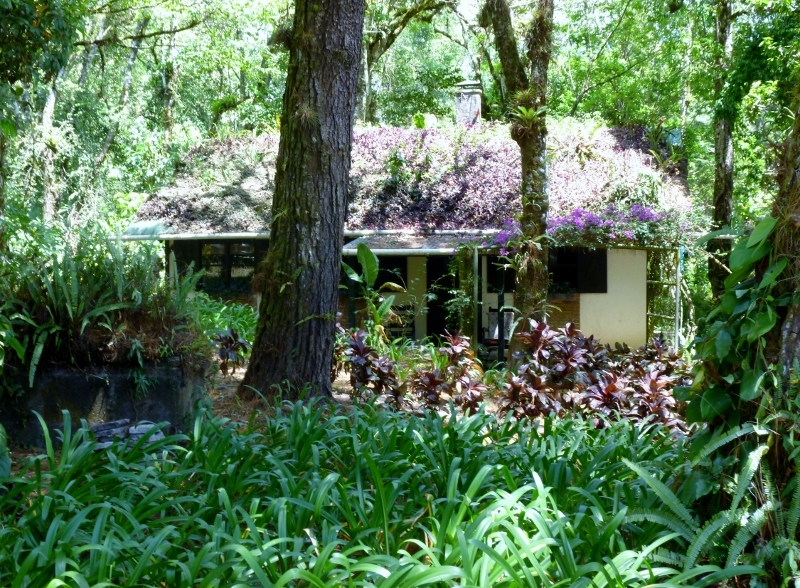 The Ecolodge was built in 1976 by Eddy and Mausi Kuhl, descendants of the original settlers who are the current owners of the 400 acre property. 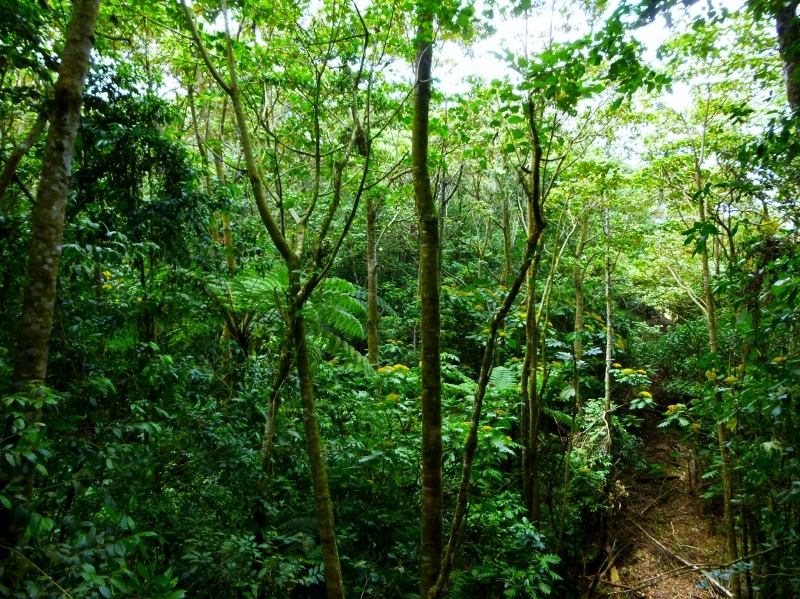 Daily tours of the historic coffee farm, observing some of the methods currently practiced for living green, horseback riding, hiking and bird and wildlife watching are a few of the things that can be done while visiting. Of course there’s always just relaxing, rocking in a chair, reading or chatting with new friends. 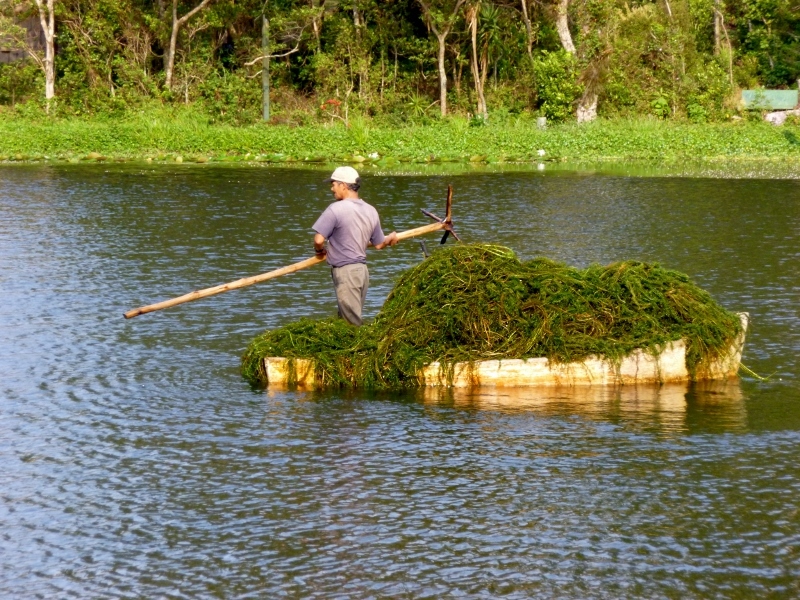 Richard says, “I read a good book, napped and took pictures of the gardener dredging algae from the pond”. 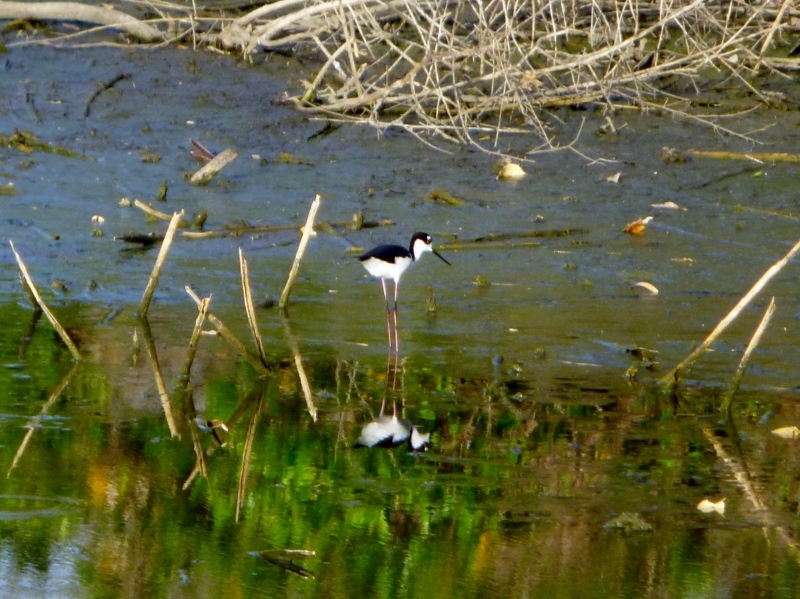 Obviously, some choices in how to spend one’s leisure time are better than others at Selva Negra. 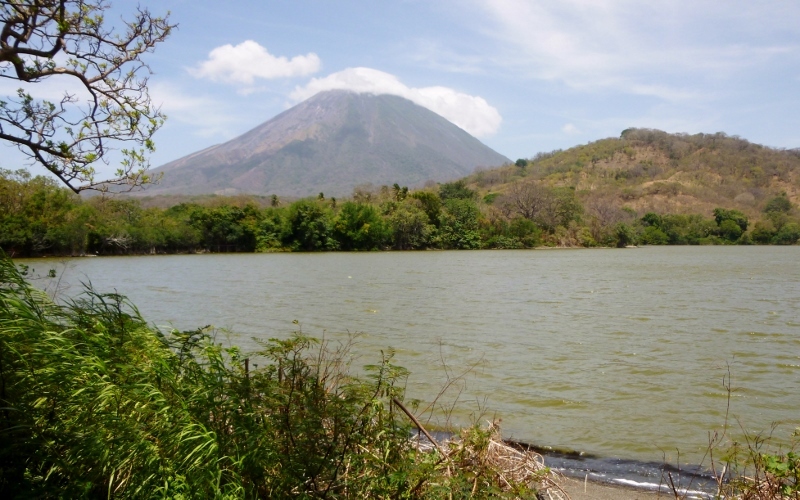 We exited the ferry onto Ometepe, an island comprised of two volcanoes rising above Lake Nicaragua’s choppy surface which are connected by a low isthmus giving it an hour-glass shape. The northernmost volcano, Concepcion, is active while the southern, Madera, lies dormant with a caldera and lagoon crowning its heights. The island is large and sparsely populated for its size with a population somewhat in excess of 40,000 inhabitants. 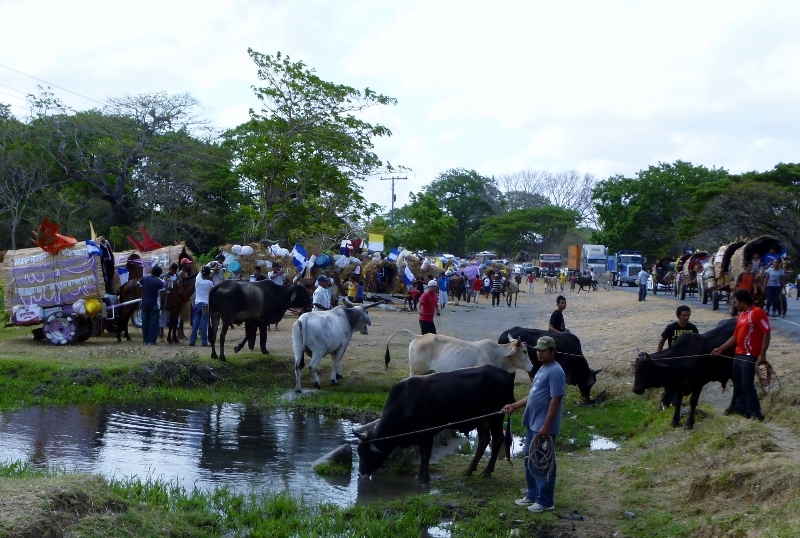 Ometepe is still primarily devoted to livestock and agriculture although tourism and eco-tourism are rapidly growing economic sectors. 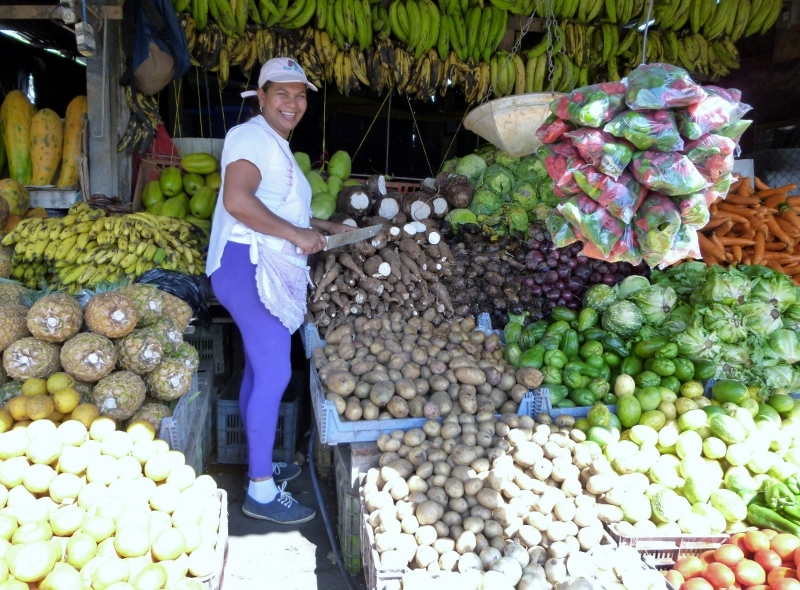 There are two small ports, Moyogalpa on the northwest coast of Concepcion, where our ferry docked, and Altagracia on its northeastern shore, with a newly paved road connecting them. A paved road also runs the length of the isthmus then abruptly ends on the northern slopes of Madera and the ride rapidly deteriorates. Clench your teeth because, if you want to go anywhere off this semi-circular road, you’re in for a bite-your-tongue, slow and bumpy journey. 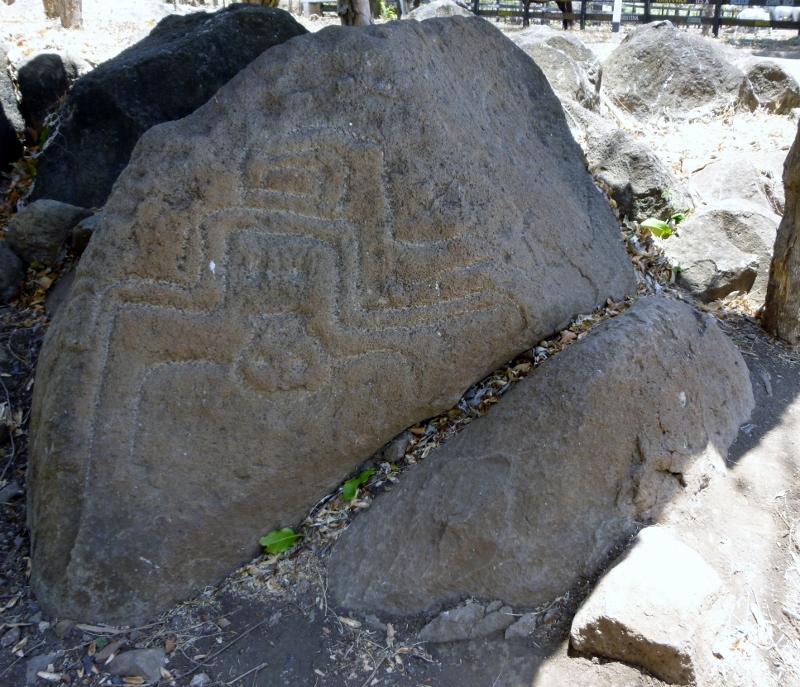 The island has an interesting archeological history whichs appear to have begun with migrants from Mexico as the initial inhabitants perhaps around 2000 BC. By happenstance, we stumbled upon Jorge Luis who was knowledgeable and who served as both chauffeur and guide during our stay. 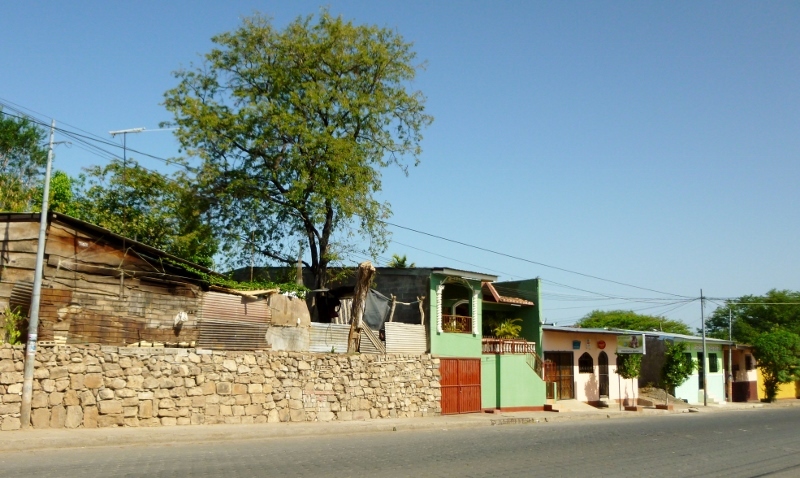 He shepherded us around the island starting with Museo de Ceibo at the end of a dirt road near a small village with the unusual name of Tel Aviv. The museum, devoted to the artifacts of the island, was much more than we had expected and showcased household and ceremonial pottery, kitchen and agricultural implements, weapons for hunting and war and burial urns. 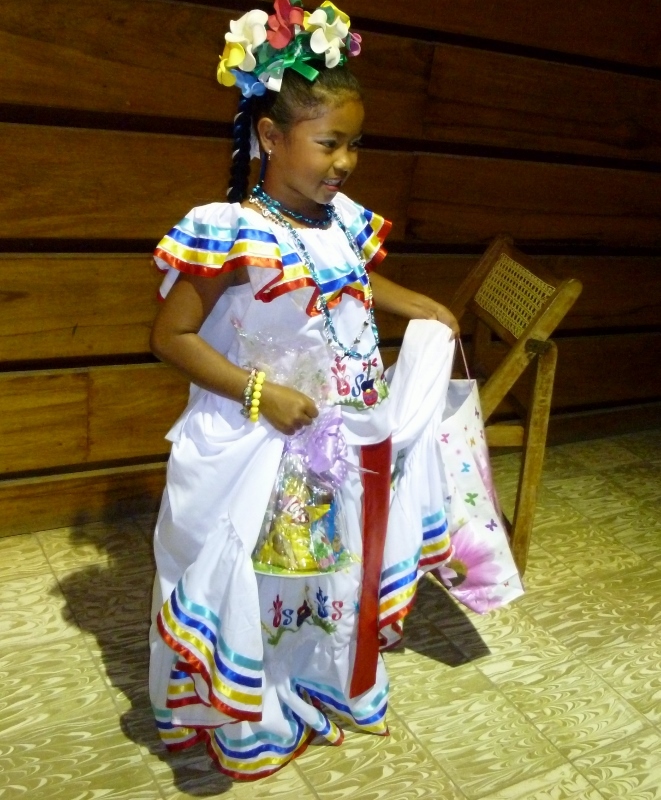 The influence of the Mayan culture in certain polychromatic ceremonial pieces was obvious. 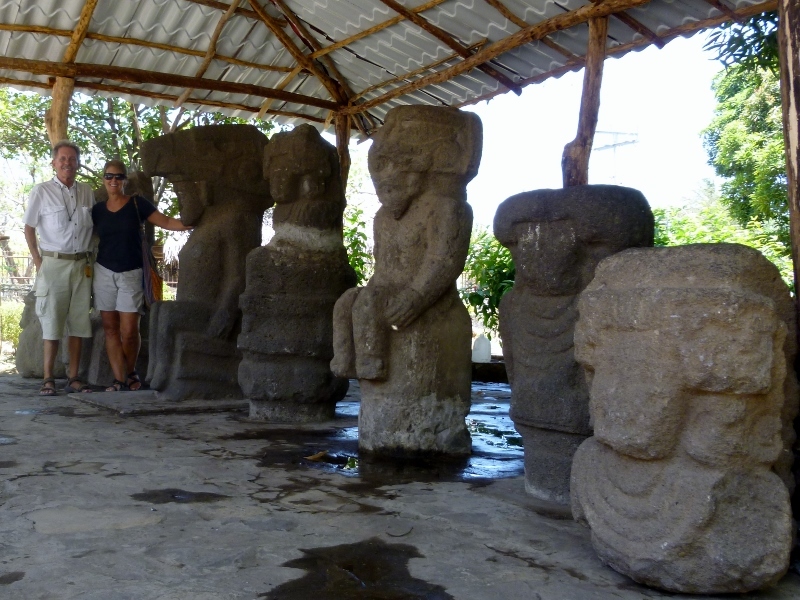 We also visited Altagracia to view the few pieces of statuary left on the island (most have been moved to Managua and Granada) and many of the numerous and sizeable petroglyphs located on the lower slopes of the volcano Madera, among the most ancient of the relics on the island. After a tasty lunch of fresh grilled fish from the lake we headed for a swim to Ojo de Agua, the Eye of the Water, a mineral spring marginally developed by an encasement of the basin in a tiered pool, situated at the end of, yet another, rutted, bumpy road. The water, crystal clear, mirrored the surrounding colors of blues and greens and the sun’s rays slanting down through the leafy cover overhead reflected mystically off the water. 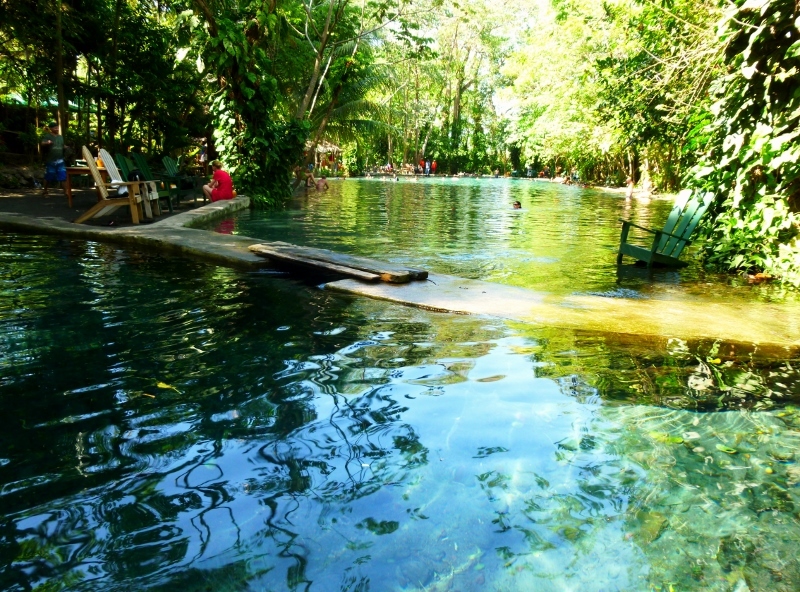 After a hot and dusty day the cool water was divine and the atmosphere of the spring was extraordinary and surreal. 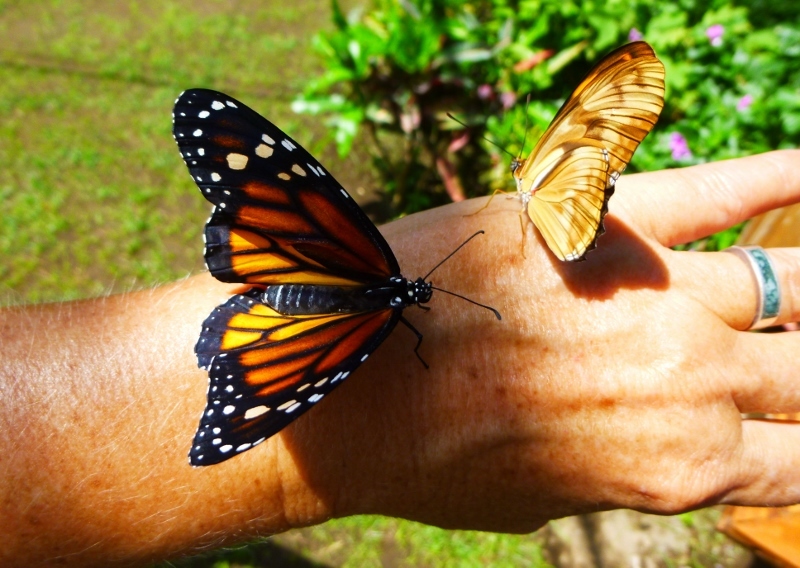 On the third day of our visit we discovered the newly opened Butterfly Paradise, obviously intended for butterflies but it could also have been called that for us humans as well. 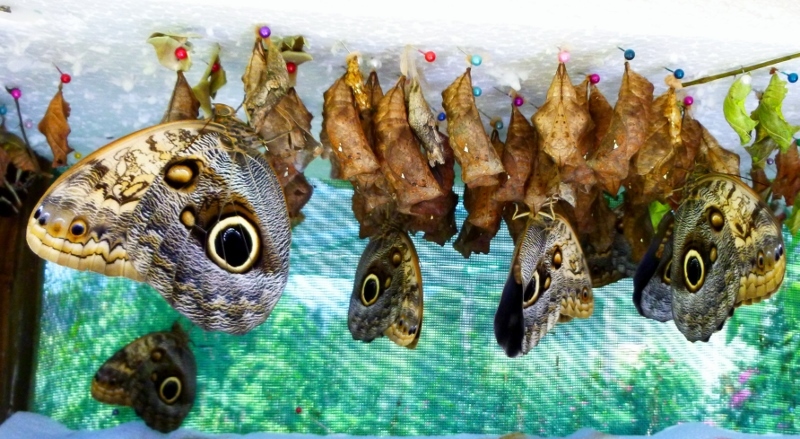 A recently built, enclosed, mammoth-sized enclosure was beautifully and artistically landscaped which allowed our flying friends to live in an environment without predators. 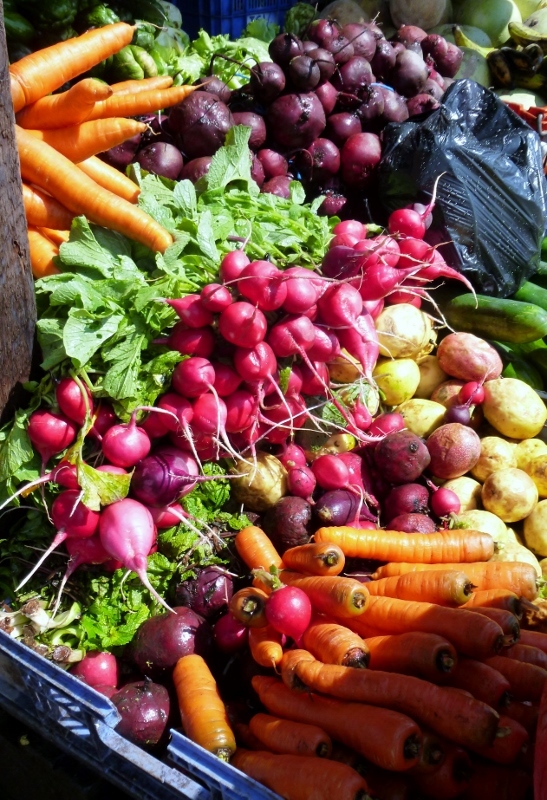 Fresh fruit was cut and strategically placed throughout the enormous space as a supply of fructose and colorful flowers offering nectar as a food sources in abounded in well-tended garden beds. For us, the only visitors at the time, it was simply an oasis of tranquility and a place to marvel at the delightful creatures. We lodged at the Charco Verde Hotel, literally translated as the Green Puddle, so named due to its association with a small nature preserve of that name, found at the terminus of (yet again!) a dusty dirt road. The setting was quiet and relaxed, nestled on the water’s edge in a cove on the south shore of Concepcion. 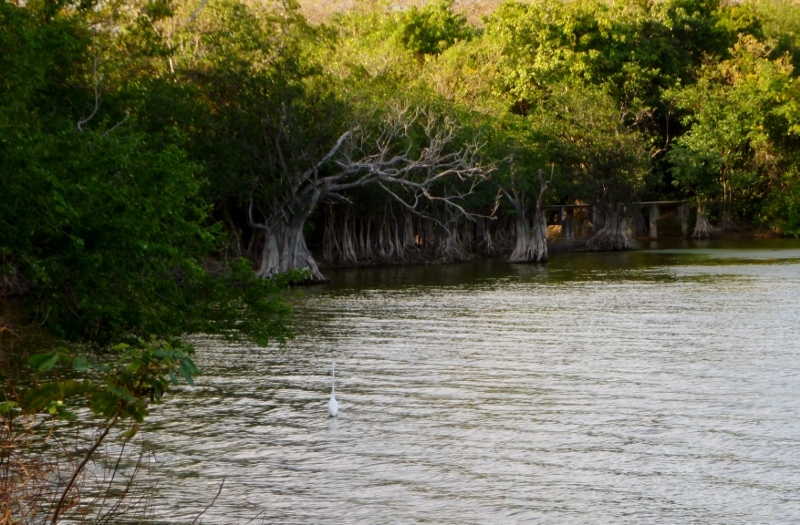 The lagoon itself, the “puddle”, was fed by a fresh water spring and was lined with trees, forbs and shrubs. 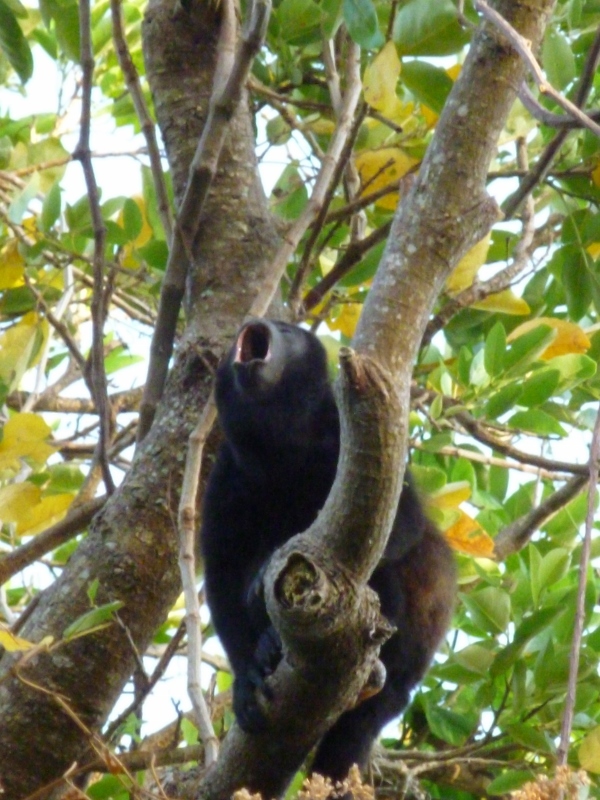 But the most appealing were the troupes of howler monkeys which we found could be witnessed each afternoon, high overhead, around dusk. The dry season provided the perfect viewing with the sparse vegetation allowing us to observe these clever acrobats and listen to their deep and reverberating warnings. All in all, a few days delightfully spent in the somnambulant life of Charco Verde serenaded by our hosts, the howlers. So much of travel is about serendipity; the unanticipated, the unknown and the totally unexpected. 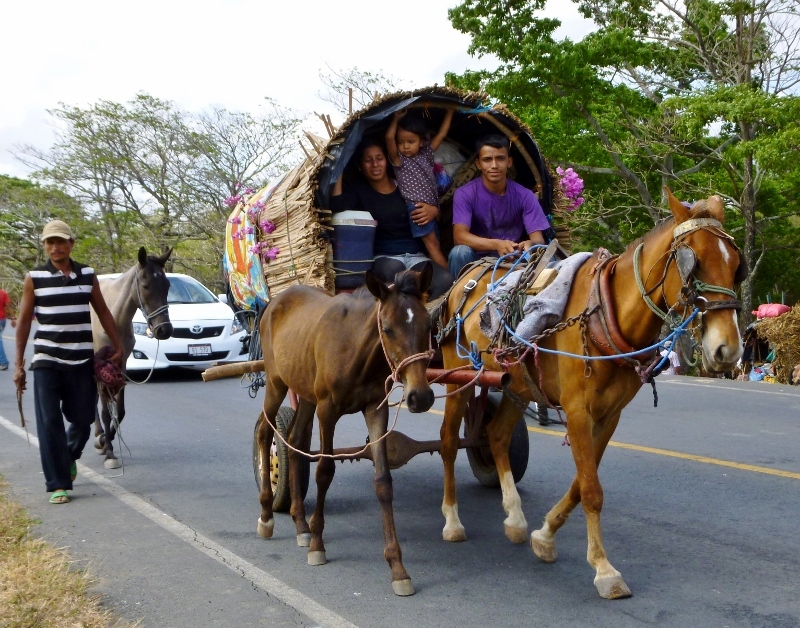 And so, imagine our smiling astonishment as we rounded a curve on the Pan American Highway south of Granada, Nicaragua, last week and found motorized traffic halted and waiting for a long line of at least one hundred and fifty carts being pulled by oxen and horses. Families with young children and the elderly passed by, either walking alongside the carts or riding inside. 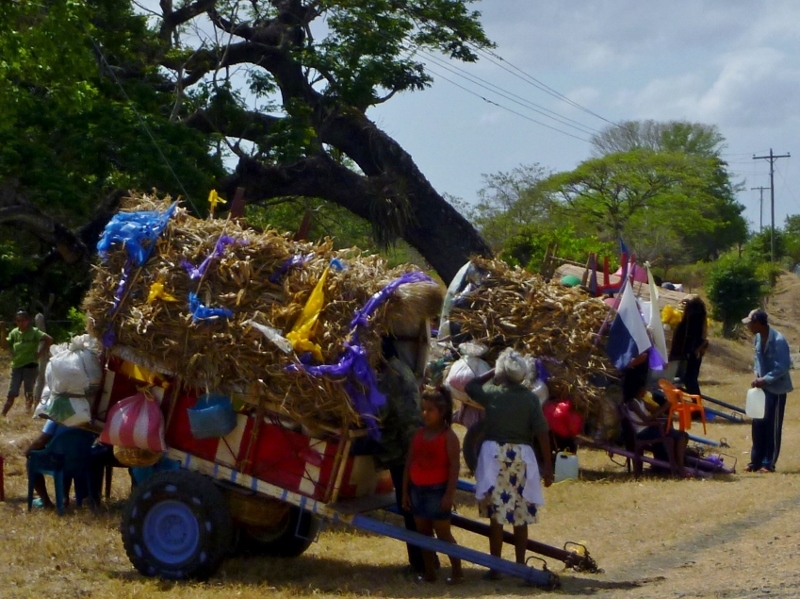 Many of the carts were in the process of pulling off the road to rest and water their animals. And, of course not able to resist an opportunity for a closer look, we hopped out of car and started walking down the road to find out what we could. The two-wheeled carts were built with a wooden base, many with aged and gray boards but others were gaily painted. They had arched frameworks that were mostly covered in sugarcane stalks and leaves to shade the occupants within from the hot sun shining overhead. 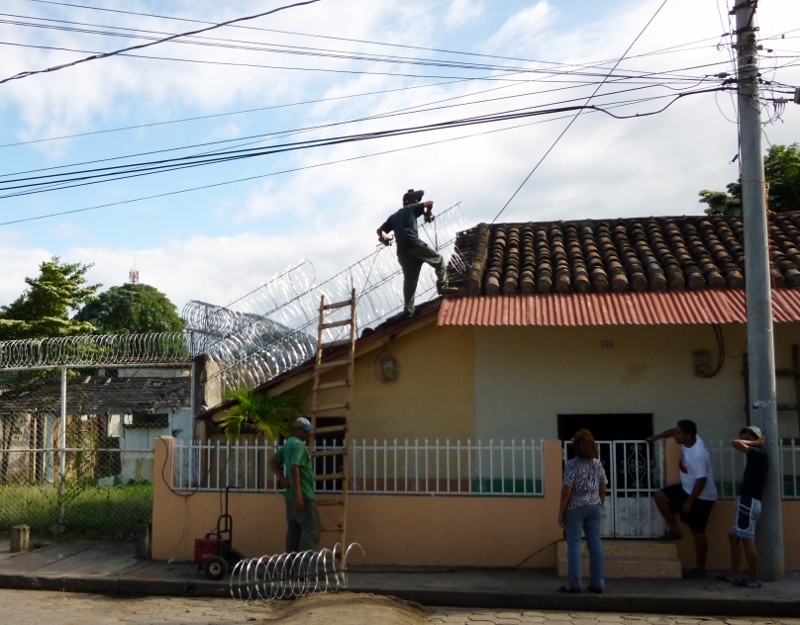 Hanging from the roofs and along the carts’ sides were buckets filled with food, straw baskets, coolers, hammocks and cheap, plastic chairs and bunches of bananas or plantains. Perched upon the top of several of the carts we spied hens and roosters clinging to roof coverings for (perhaps?) their last ride. 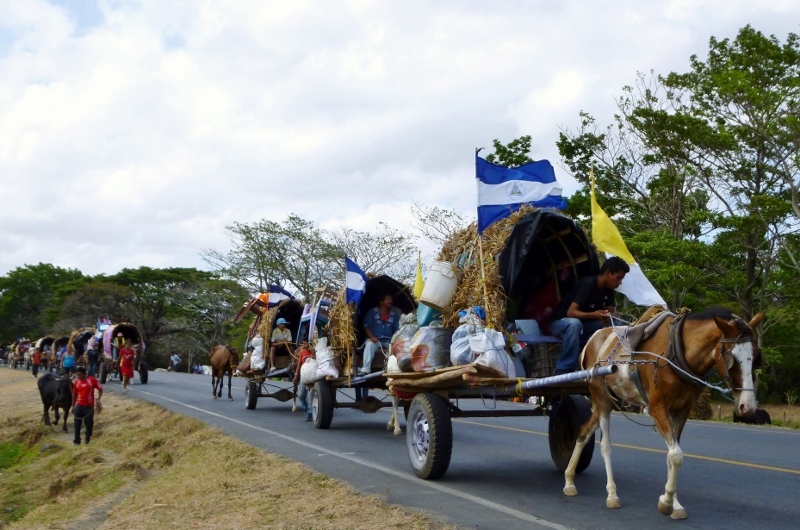 Many carts displayed yellow flags which signify the Catholic Church and the blue and white national flag of Nicaragua. Some were draped with a large purple cloth representing the upcoming Holy Week and stamped across with the name of the city from which they ventured. 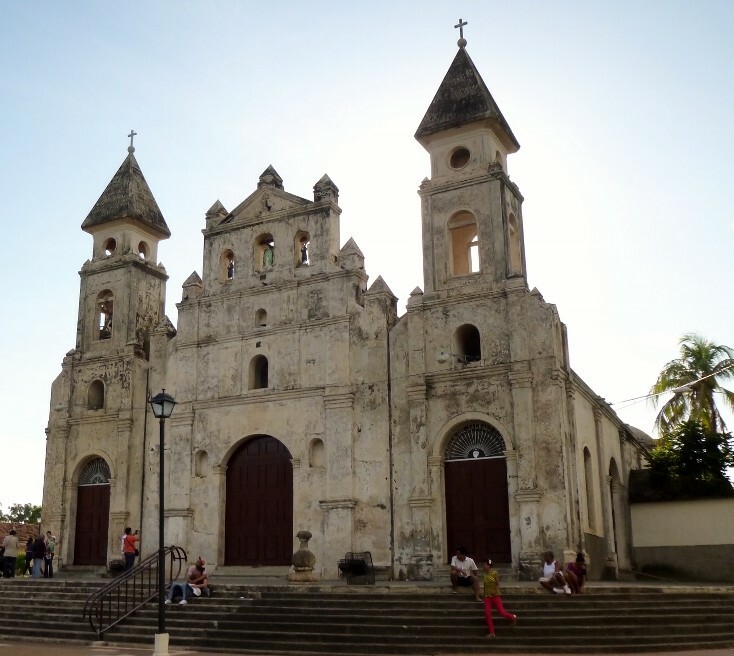 Nicaragua is a Catholic country and the culture is rich in religious beliefs and folkloric traditions that may vary from region to region; many are prominently on display during Lent and Semana Santa or Holy Week, the week preceding Easter Sunday. 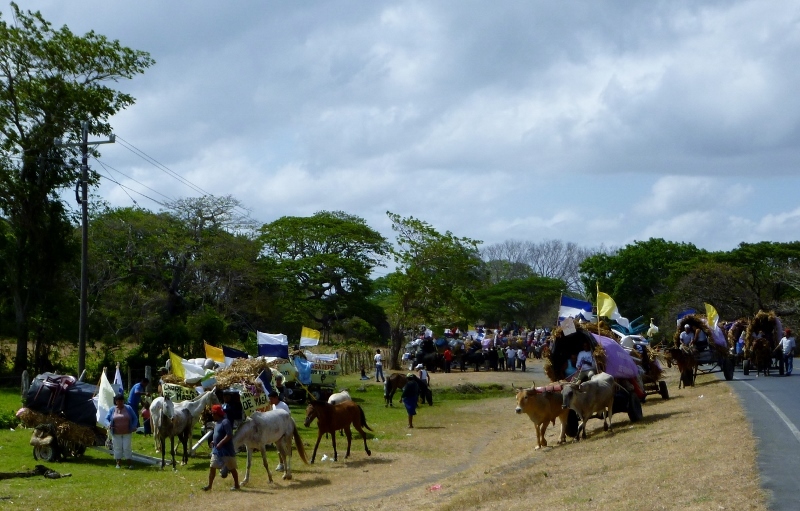 We found out later that the caravan that we had seen formed the return trip of devout pilgrims visiting Popoyuapa, a small village of 4,000 near San Jorge, Rivas and Lake Nicaragua where a four-day festival occurs each year before Santa Semana. The Sanctuary of Popoyuapa is the home for the Shrine of Jesus the Redeemer, a life-size Christ figure wearing a traditional crown of thorns. The image is also known as Jesus the Rescued, possibly named so after the floating statue was retrieved from Lake Nicaragua or, according to another story, after being pieced back together following an earthquake in 1844. 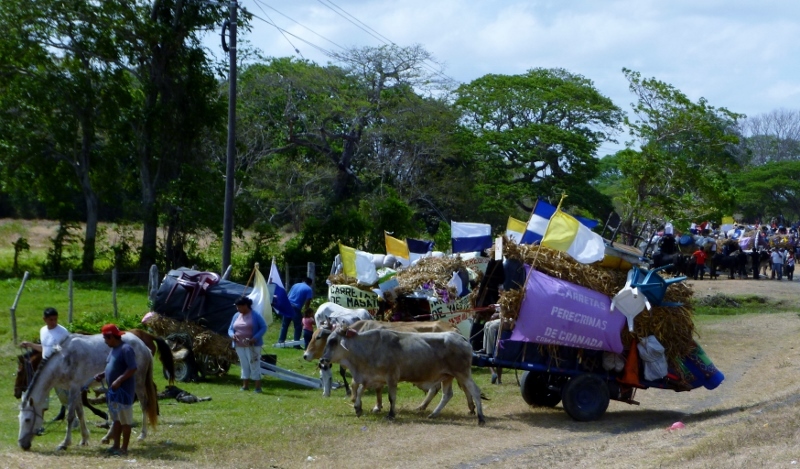 In addition to those making the symbolic pilgrimage by oxcart, thousands more of the faithful visit the shrine during Semana Santa to show their devotion and express their thankfulness for what they’ve received, for favors divinely granted or to ask for miraculous intervention in their needs. 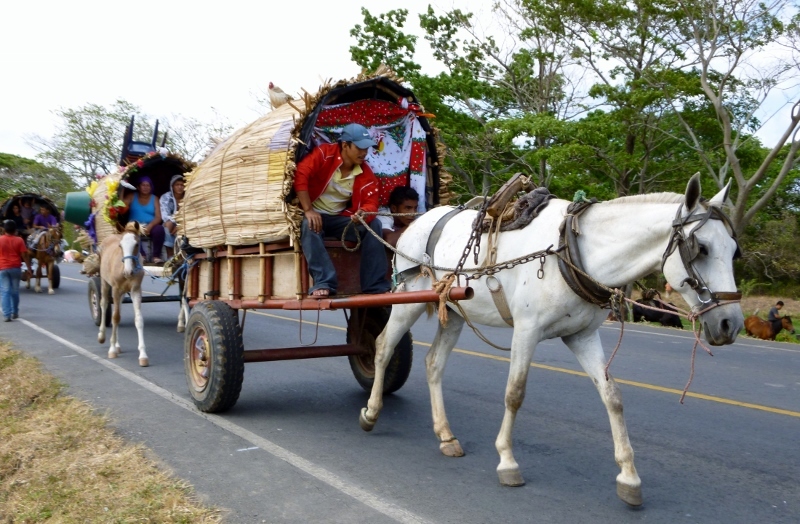 The pilgrimage by oxcart to Popoyuapa is a tradition passed down through the generations and has occurred for at least a century with the faithful traveling from as far away as Masaya and Granada in a journey that may take as long as four days and cover up to 150 miles round trip. 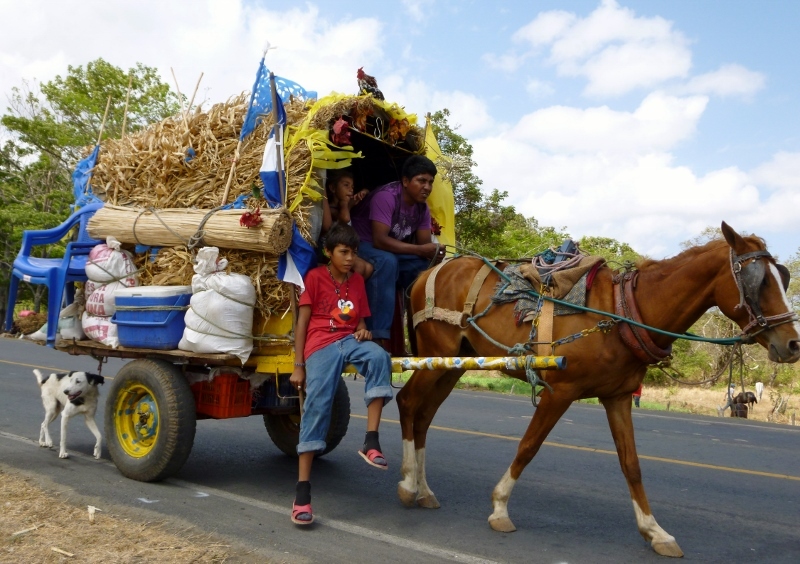 Except for a chance encounter on the Pan-American Highway we might never have seen this astounding caravan of oxcarts plodding down the road nor learned of this religious pilgrimage of the deeply faithful. 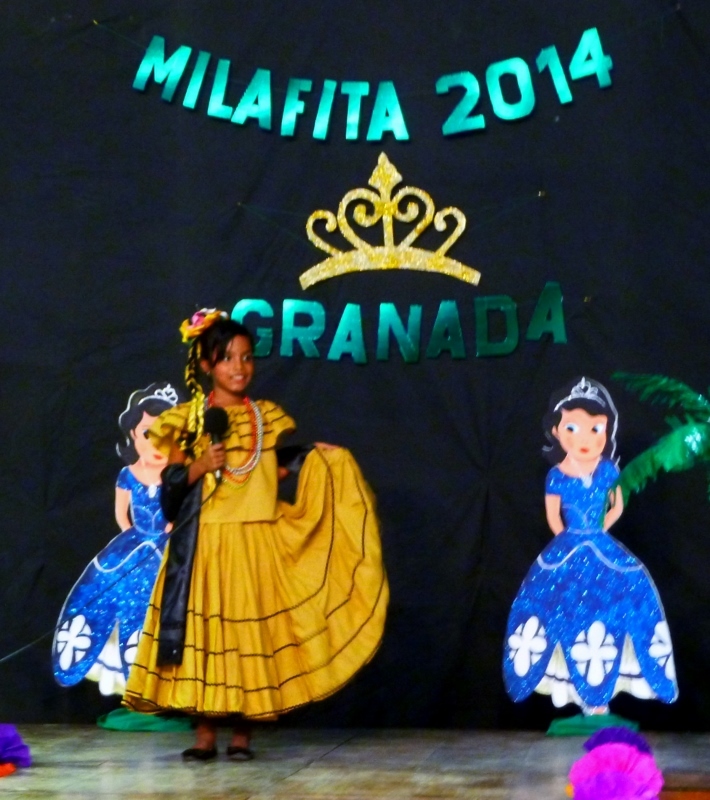 We were not certain what to expect as we walked into the auditorium of Casa de Tres Mundo in the heart of Granada on a Friday morning. We knew that we were attending a scholarship contest for Priscila, the 10 year-old daughter of Yanni, whose family has graciously lent a portion of their home to the school where we had volunteered for the last three months. In fact, we had supervised our older class the previous day in making posters to raise and wave supporting Priscila’s effort in competing for the prize. And we knew that some of the volunteers had been working closely with Priscila the last couple of weeks on the academic portion of the match, rehearsing answers to the questions that might be asked. 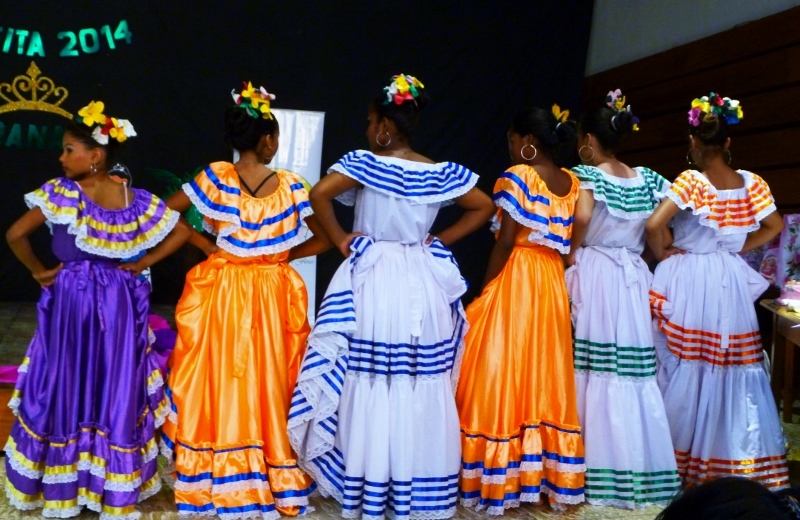 We also understood that of the eight participants, only one would advance to the final competition in the capital city, Managua. Now we were prepared to operate on SOTB (South of the Border) time; we’ve pretty much acclimated to that aspect of life in Latin America. So we knew that we might have a bit of a wait when we arrived on time at 9:00 AM. But we had our friends and volunteers from the school there, Priscila’s immediate family, the directors of the NGO and a small contingent of students from the Pantanal school. The minutes ticked by slowly and, when the event finally began, it was not fashionably late, it wasn’t SOTB late, it was an hour and forty minutes late. Even the locals were beginning to despair. 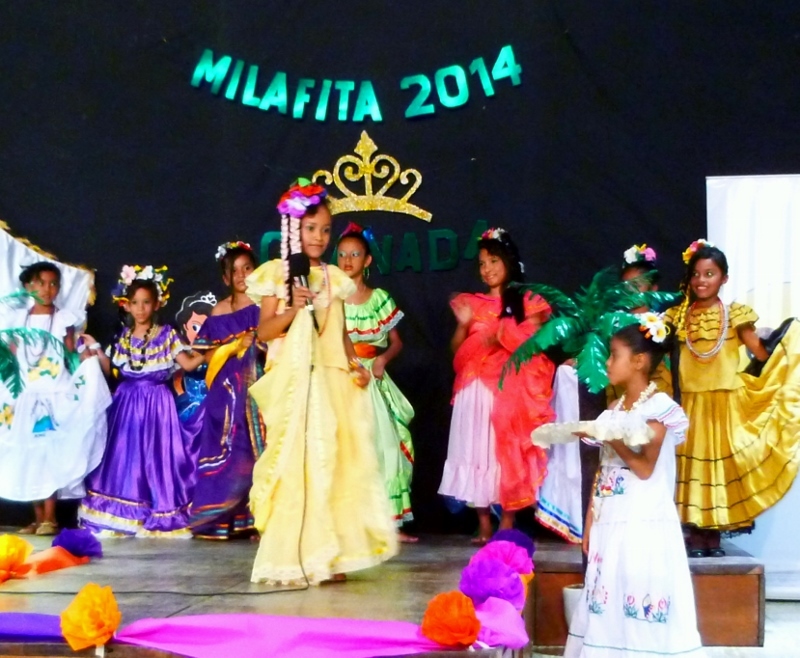 We used some of the long wait profitably, however, and learned a bit about our hosts, MILAVF and La Fundacion Casa de Tres Mundos. The former, known also as Movimiento Infantil or the Children’s Movement, is a nationwide organization that, for 34 years, has worked to enact and enforce child protection laws. 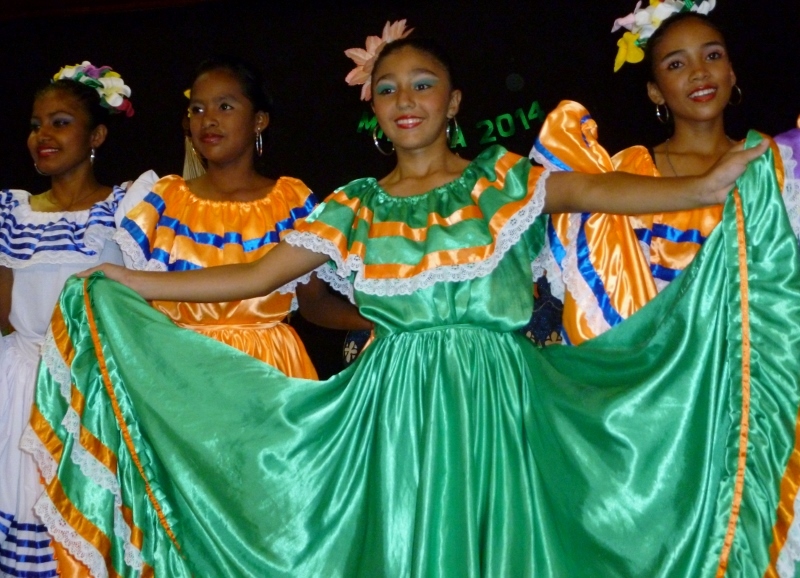 They work in communities with at-risk children and adolescents, organizing them into dance troupes, sports clubs, performing and visual arts classes and ecological projects. 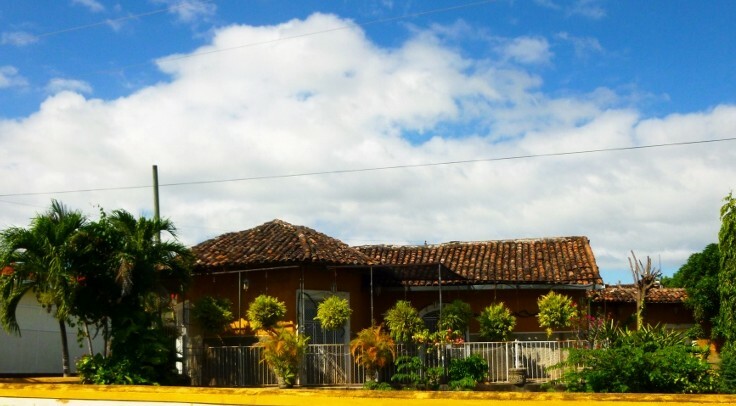 La Fundacion Casa de Tres Mundo, which began in 1987, was founded by an Austrian artist and author and a Nicaraguan poet, priest and politician. 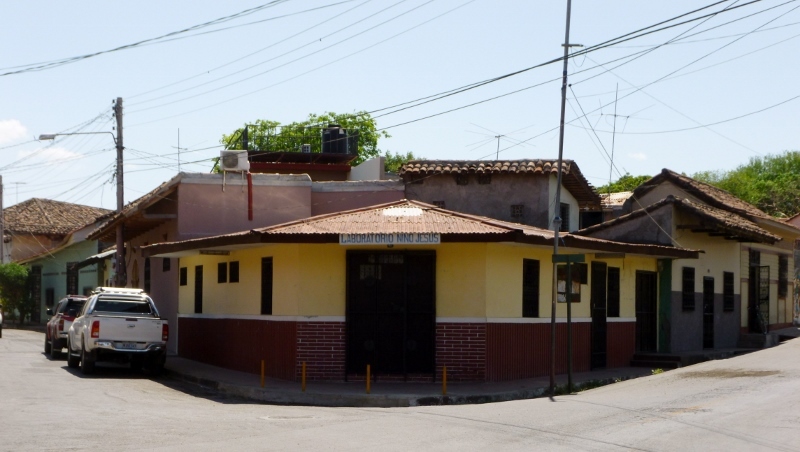 It has steadily expanded to include classes in the arts, dance and theater for the children of Granada, an art gallery with rotating exhibits for the public, a free, communal radio station and an arts program to encourage youngsters in the poorer barrios of the city and beyond. When the competition finally began it was with each of the girls coming down the makeshift runway in sports attire: a tennis outfit with a racket, a cheerleader with pom-poms, a soccer player with ball and so forth. It was a bit un-nerving to see these young girls striking semi-seductive poses during their introductions and sauntering flirtatiously. 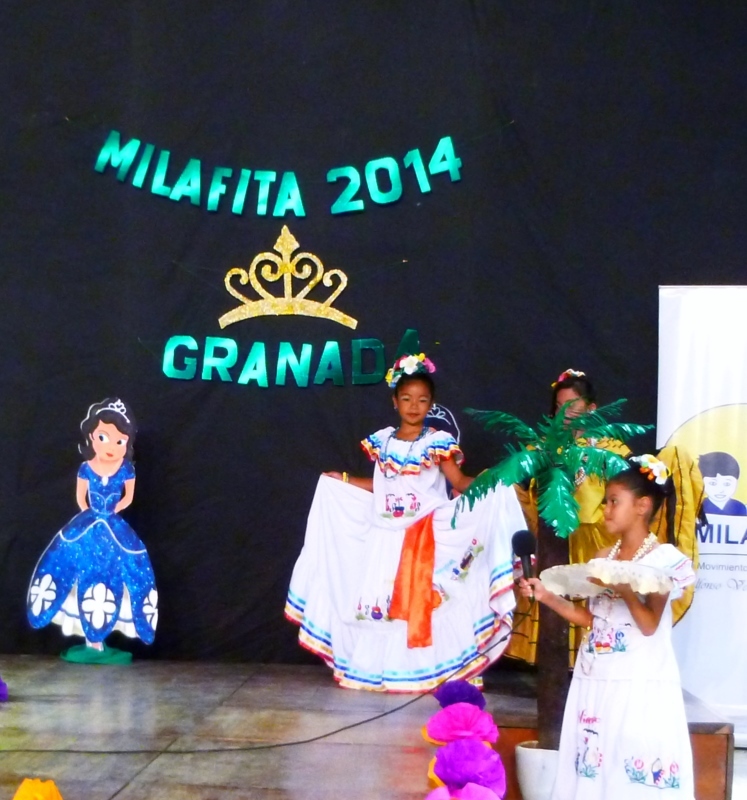 Following this was a segment with the girls in their colorful, traditional dresses of Nicaragua, which included a short introduction to the judges and a brief Q and A for the academic portion. Interspersed with the program presentations by the eight young contestants were dance numbers by various ensembles; these were highly entertaining.